I'M OFF TO TERRORIZE YOUR GRAMMA....WANT ANYTHING FROM THE KITCHEN? You got to get rid of some of that crap in the closet. I need room for my stuff, too, you know. Mind if I move to under the bed, there's no heat in that closet. I heard a creepy noise outside. Would you mind if I sleep with you? "I'm leaving, Obama's in the closet and will be taking over your nightmares." I don't care if you think it's just right. Take your script for Little Red Riding Hood and get the blartz out of my bed. Demon? Demon? Mon name est"Desmond!!" and I am FRENCH....and I SMELL!! !...Not because of my heritage but because of those clothes ...WHEWW! "Hey, punk...I'm da Demon of Publik Skrool Future...make sure ya duzzint get too attached to dem 'big boy books'...in less dan a monf, I'll have ya back mindlessly See Spot Runnin' an' goose steppin' into a life of complicit servitude." Gotta go kid. The "New York Times" says this is their turf. "I'm da haint of Modern Societal Decay & Ineptitude. Somebody left one o' them cable news channels playin' on th' TV & somehow I managed t' fall out. Can you give me a boost back in?" On behalf of all the monsters under your bed, could you put your shoes in the closet over there? They're stinking up the place! Can I borrow your toothbrush? I woulda been the hell out of there when they named my stuff "miracle metal"
"Lissen punk...I'm da Horny-Toaded Wood Fairy...If ya duzzint go back t' sleep so's I kin do my ting, I'll sick da Aquaficatious Hydra on ya...an' I duzzint tink ya wants dat mornin' suhprize agin', do yuh?" Your mom said to turn off the lights and go to sleep. But,,,,,If you turn out the lights, I'm gonna get you. 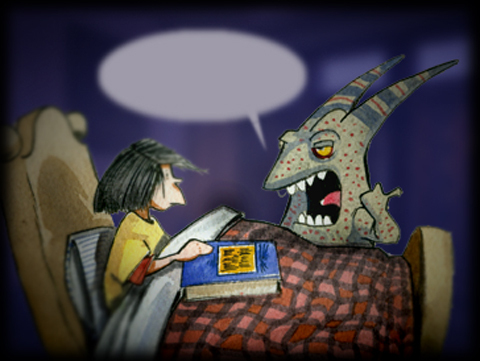 So, here's the quagmire: Do you listen to your mom, or do you listen to the monster? Either way, you're dead meat. You don't scare one bit. My mommie told me there's no such thing as a kid living in my bedroom! This page contains a single entry from the blog posted on July 28, 2008 1:51 AM.